When adidas create and release a brand new boot silo, you know that they have something special in store for the market. 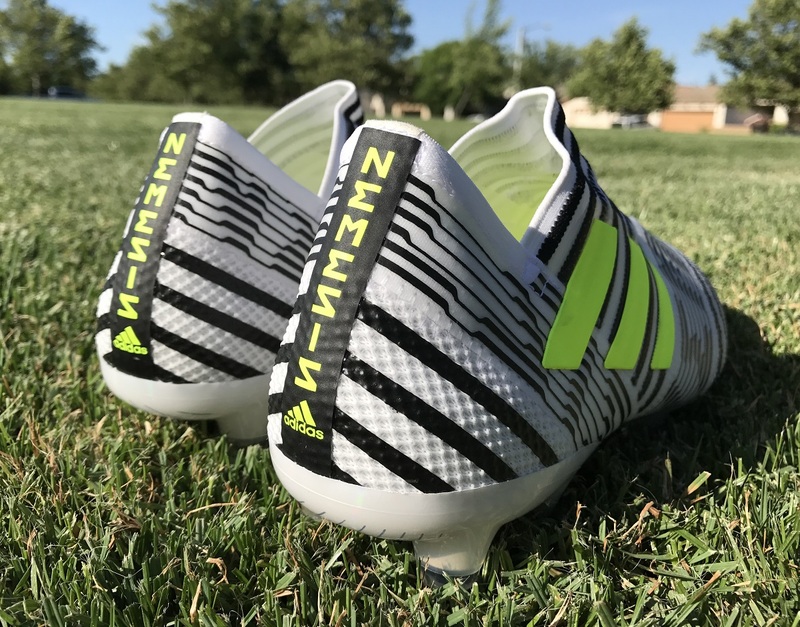 Built for the agile creator, Nemeziz is set to play an important role in the market as a key silo alongside the Ace and X. adidas delved deep with the development process on this one, tapping into a common ritual in ancient battle, in dance and in sport: the use of taping for increased physical and mental strength. Yes, we are talking medical tape of bandage wrap here, with individual layers used to wrap around and lock down the foot. To call the overall design wild is an understatement, with the 3-stripe taking on a completely different type of construction technique. The big question, then, is how do they actually function on field? And is the laceless version going to actually stay on foot without slipping off? Over the past few weeks since they were released to market, we have had the laceless and laced version in testing. 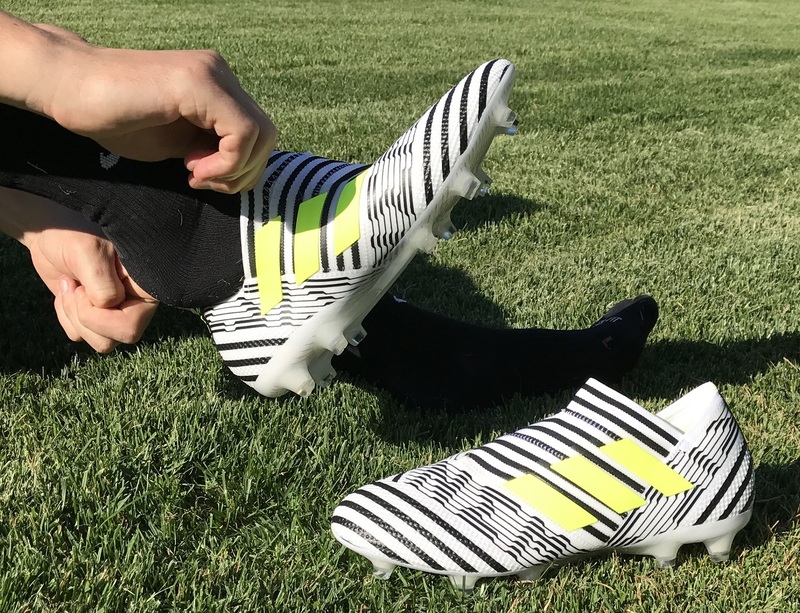 Here, we talk through the more tech heavy laceless Nemeziz 17+ 360Agility and break down what they have to offer. Find the elite tier 17+ 360Agility available with free shipping at soccer.com. The zebra style black and white upper material is pretty unmistakable. Not quite what I would label a stylish design, but that is not the purpose. adidas has created something intended to stand out from the rest, something that will showcase their AGILITYBANDAGE layered upper. Since they don’t have a mid cut collar, it is interesting to see they are laceless and I’m interested to see how that plays out from first wear. So, the first big question with these is how easy are they to slip on your feet? 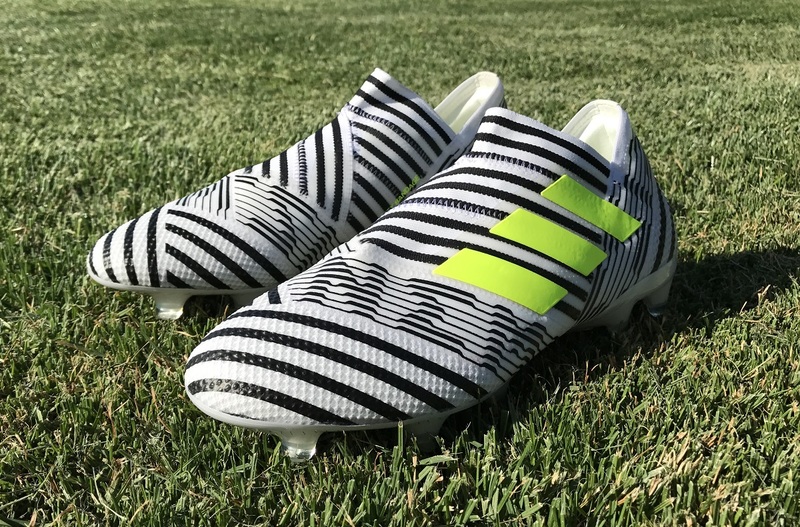 Being that they are a laceless design, adidas needed to create a tighter fit around the ankle and as with similar styled boots, it creates some initial concern. Good news; they are very easy to get on and off! Basically, adidas use a V shaped cut around the ankle that allows for additional stretch. By angling your foot in, sort of at a 45 degree angle, and using the front and back lip as pivot points, you can easily push your foot in. And there is no need for pull tabs. Now that you have them on, how do they actually fit across your foot? And do they stay on your feet? Well, being that they are laceless you won’t be surprised to hear that the fit is naturally very snug across your foot; it has to be. But, because the material is like a bandage, it has ample room to stretch. Of all boots on the market, this is the one that will offer the best fit across different foot shapes. My medium/wide foot was very comfortable inside and there were no pressure points. In fact, they feel a lot like you are wearing a pair of tight slippers and they make for one of the most natural fitting boots you will ever wear. 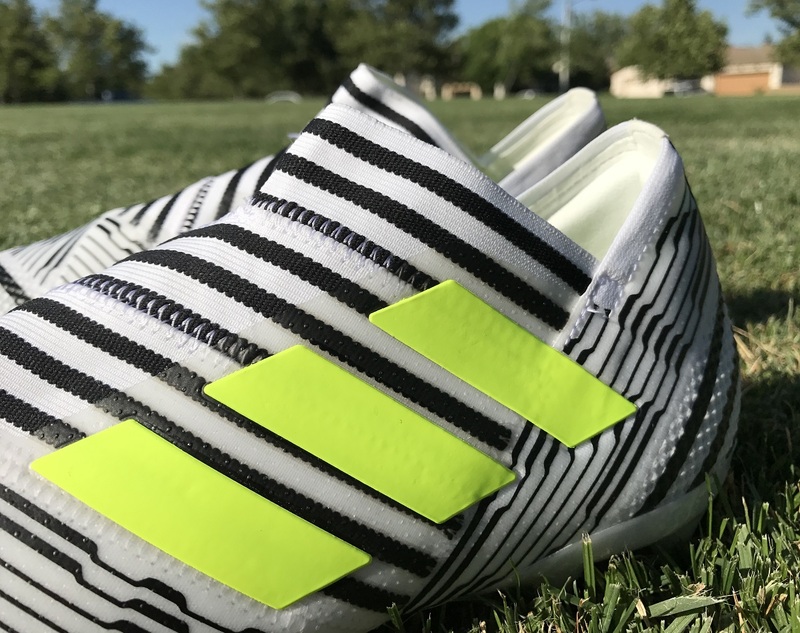 In terms of length they are true to size, very much in the mold of other adidas boots such as the Purechaos and Purecontrol. Out of the box, these are an absolute dream boot to wear. There is little to no break in time thanks to the elastic fit through the upper. You basically slip them on, and that is the type of fit you can expect through wear. adidas has layered the extremely unusual 360 Agility Bandage in a way that ensures it supports itself, doubling up in some areas and stitching areas across other pieces elsewhere. Inside the boot, they are layered with a really impressive padded suede like material, so they have a soft yet connected feel that helps offer additional grip with your socks. They also have a bunch of very small silicon squares on the front lip that help add additional grip. Underfoot, the soleplate breaks in very easy also. The first time I took these out to test, I wore them in a scrimmage game and they felt great. Soleplates are regularly the area of the boot I have most concern with, but here the TorsionFrame easily molded and flexed in a natural fashion from first wear. The only other area of concern I had going into testing was the V shape cut around the ankle. A dual-lock collar secures the ankle in place to enable explosive change of direction. 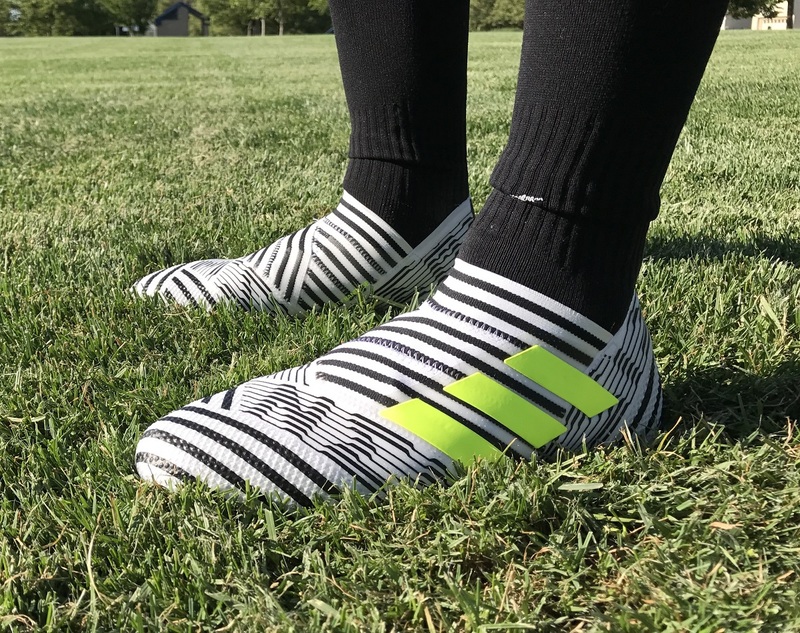 Because the material is elastic, it wraps up real close to your ankle, and some players might not enjoy the feel through tight turns and chops where it presses up against the ankle. Personally, I didn’t have a problem with it, as the material felt soft enough and it never irritated my leg. But, I could see how some players (especially those now used to a regular ankle cut) could find it irritating. And that leads us to general performance and what you can expect in play. Well, first to note here is that they are intended to be agility focused, with adidas looking to create something that enhances players ability to be crafty in tight spots, with quick movements and close control on the ball. Obviously, Lionel Messi is the type of player that inspired the overall design. 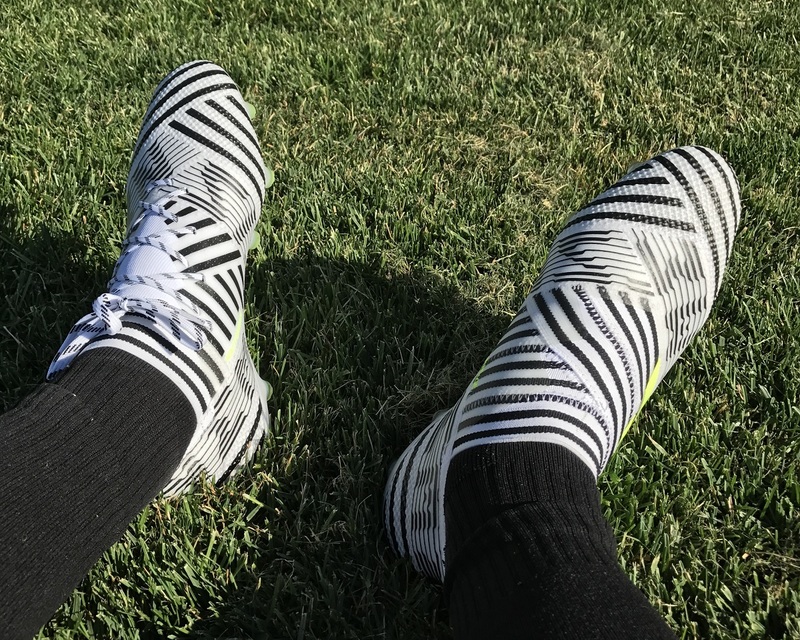 Using a bandage like material through the upper means they are never intended to be a power boot, and you won’t be surprised to hear that they don’t offer a great deal in the way of cushion on the ball – or from opposing players studs! Your foot will end up absorbing a lot of the impact through play, with the material sitting firmly up against your foot. What that actually does is enhance natural feel, and it very much falls in line with what adidas want you to experience. When striking shots, they are not going to help much with power, but they are ideal for placing your finish. Again, we are talking about the ability to naturally connect with the ball in tight spots, providing a clean touch so you know where the ball is and where you are going with it. Across the top of the boot, where the AGILITYKNIT is used (as per the details above) there is a lot of texture that also helps elevate the amount of grip you can get on the ball. So in summary, they are a great boot for touch and feel on the ball, but not so much for taking powerful shots. Underfoot, adidas use a new TorsionFrame and it pretty awesome. Sometimes sticking to a minimal style design works best, and that is the case right here. On this release colorway, the soleplate is transparent, so you get a proper sense of exactly what is going on. Through the midfoot, a dual layer spine adds support without decreasing the amount of flex that you get. Through the forefront, you also get a ton of flex from first wear, so they feel broken in from very first wear! In terms of studs, you get 7 up front and 4 under the heel. Each stud (or blade) is shaped like a half-moon, with the flat area facing toward the center of the area. I wore these on both FG and AG surfaces. On FG, they felt great and really worked out well. On AG, a good artificial turf surface, they felt a little tackier than normal. It wasn’t like I was tripping over because they were sticking in the surface, they felt a little too grounded through play. Why exactly that is, I don’t really know. It might be related to the actual shape of the studs, or the actual positioning, but they weren’t as clean as other boots like the Purechaos, which is a perfect option for both surfaces. My only real reservation relates to the upper material and the fact they tend to pick up dirt pretty easily. The white on this version, in particular, tends to look worn after only a few wears. Unlike other synthetic or leather boots, you won’t be able to clean these very much even if you put some extra effort in. So, I’m waiting on other colorways to see how different the process is. The other note is that these are a laceless boot, and like all laceless boots that means they don’t breath very well. 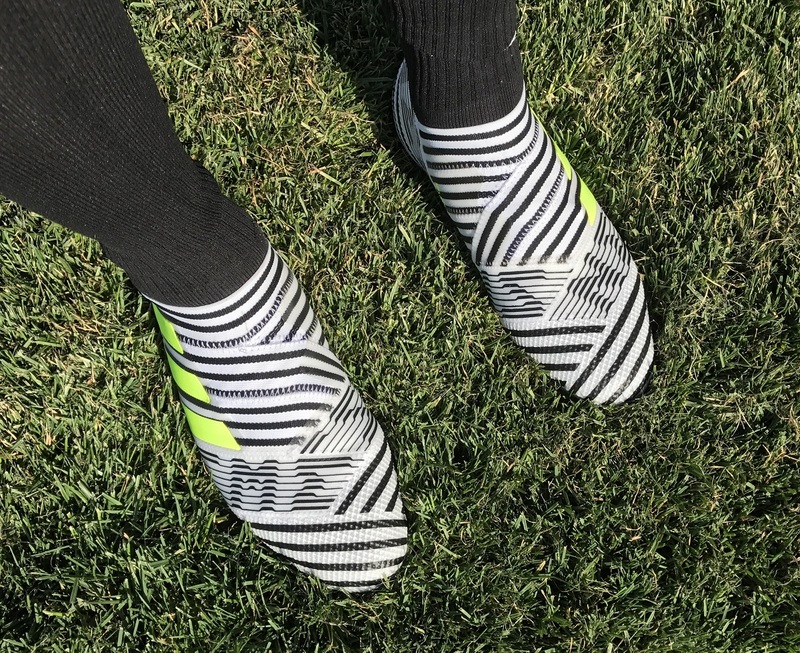 You will need to air them out after every wear, or you will quickly find your soccer bag smelling like a skunk who just got startled by someone beeping a car horn! Highlight: A perfectly balanced agility boot that harnesses bandages to create an effective laceless and extremely natural fit. Would I Buy Them: Hate the price, but they are a pretty phenomenal boot. They fit so nicely and perform excellently in-game. Other than the colorway there isn’t anything I don’t like about them. So, I’d give this one a solid yes. 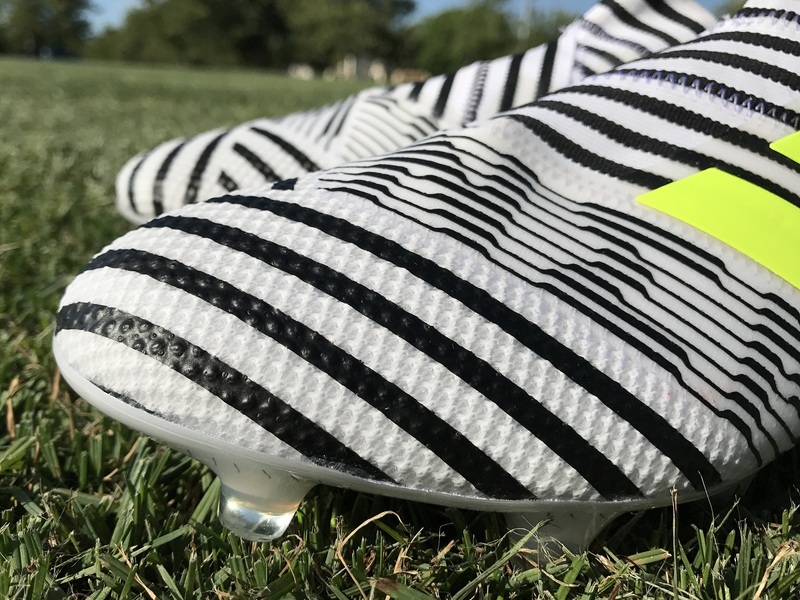 Player Position: This is a very versatile boot, so it more depends on your style and if you are looking for a naturally snug fitting boot that enhances agility but offers little protection. He's not sure how it will work… will it loosen up? He loves the pure agility as it helped alleviate his Achilles problems. Any ideas on this cleat for that. I'd hate for him to get that problem back and this is an expensive cleat to try and then be stuck with it. Because the heel features an agility bandage style material, it is intended to be tight around the Achilles. 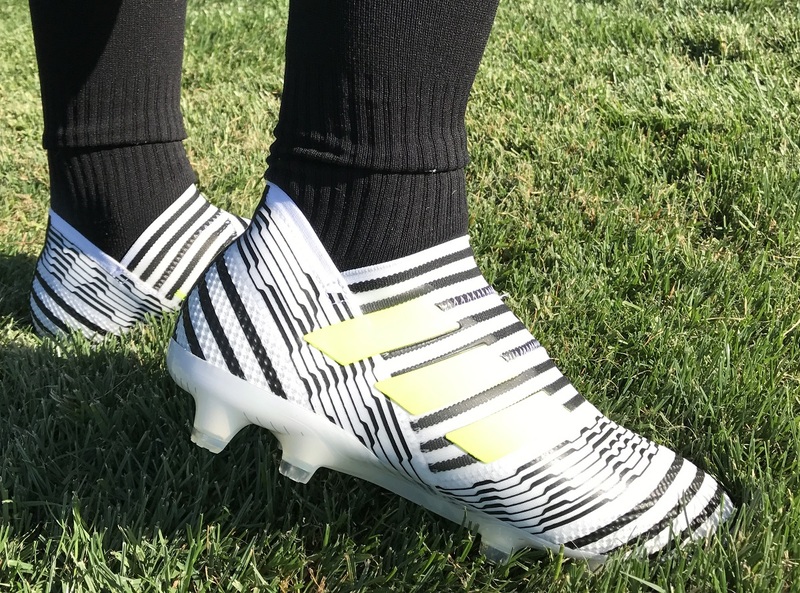 You'd be better off looking at laced boots, where he can get the desired tightness through the forefoot without having to rely on the ankle lining to provide a secure fit. Adidas really has a messed up sizing . I mean, I wear a UK 9/ US 10 in Nike . If I get a 10 US for these, that means the UK size would be 9.5 . Should I stick to my US or UK size for these ? I'd imagine the left toe issue is caused when he drags his foot on shots, when you shot with your right, the left toe tends to drag on the ground. A more obvious problem when used on turf pitches. Does this boot fit wide foot?